Wendy’s by Diego V licensed under Creative Commons. It might be DC's most awkward and hated intersection: the spot where New York Avenue, Florida Avenue, and several other streets all meet. But DC Councilmember Kenyan McDuffie has asked for funding so DC can buy the Wendy's, demolish it, and design something better. Here's how that would work. These roads surround a small triangular parcel which has a Wendy's restaurant. It's been notorious for traffic congestion, unsafe crossings for people on foot or bike, and general unpleasantness. In an effort to make the intersection safer, DC made most of the roads one-way, particularly Florida Avenue, forcing people in cars to drive around in a "virtual circle." Since the Wendy's is in the center, it got the name "Dave Thomas Circle" after the Wendy's founder. This arrangement wasn't satisfying either. It's hard and confusing to cross on foot or bike from the Eckington neighborhood in the north to NoMa and the Metro in the south, or to travel along Florida Avenue east-west. If you combine crashes at the three corner intersections, this is the city's most crash-prone spot, with 455 crashes from 2015-2017. And it's still congested, though arguably that's not solvable at least without making the area inhospitable and unsafe for anything but cars. The District Department of Transportation studied the area and devised a number of options, which it then revised to two finalists. "Concept 3" would keep the Wendy's but take some of the land to add sidewalks and bike lanes and widen some of the roads in order to allow for turn lanes, theoretically smoothing traffic. The other, better option, "Concept 6," would remove the Wendy's entirely and realign First Street to connect directly from NoMa to Eckington Place. It would leave two green spaces in an area that needs them — DC upzoned the NoMa area but didn't leave space for parks, a mistake that's cost tens of millions of dollars after the fact to rectify after property values skyrocketed. 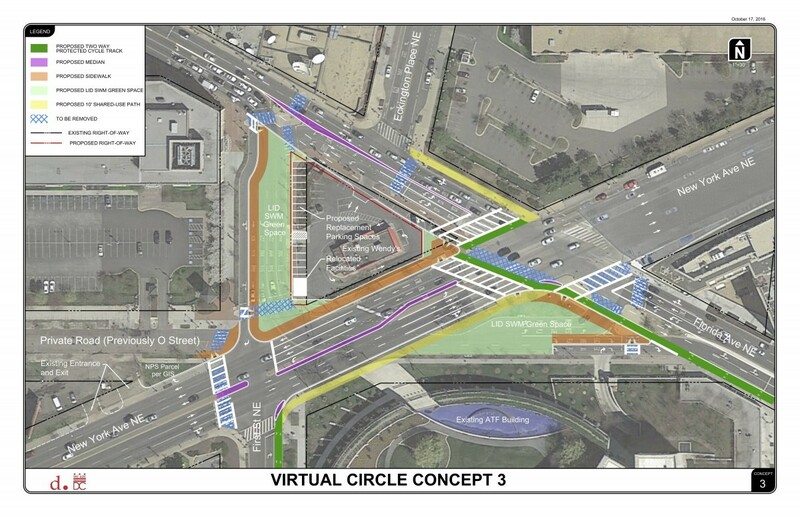 Both options create a green space where O Street NE is now, on the south side of the intersection. To remove the Wendy's will require DC to buy the land or take it through eminent domain. The likely cost has been reported at around $6 million, though there hasn't been a formal appraisal released yet. DDOT officials would prefer to go that route, and Ward 5 councilmember Kenyan McDuffie, whose ward includes the parcel, has asked Mayor Muriel Bowser to include this funding in her upcoming budget. Concepts 3 and especially 6 are better than what's there, but still have some major flaws. Look at the number of turn lanes. Florida Avenue, in particular, has gotten two whole lanes wider. Before 2010 the layout looked not that different from Concept 3, only 3 has shrunk First Street while widening New York and Florida avenues. That means those roads will be harder for non-drivers to cross where they meet. Some traffic engineers hold the mistaken, and long since debunked, belief that the safest thing for roadways is to keep all the cars moving at all times. If they have to slow down, then drivers get frustrated, maybe change lanes, maybe do something unpredictable. Instead, just keep them moving and happy. It's the traffic engineering equivalent of saying that women should never wear yoga pants because it might make some men misbehave. The problem with this attitude is twofold. First, as the roads get wider and wider to keep the cars moving, they become harder and harder for people to cross. The engineers want to keep crosswalks and bike lanes out of the busiest spots, forcing people walking and biking to take a circuitous route or cross anyway, maybe get hurt, and then get blamed by the engineers. Second, the greater speeds induce more driving. Because it's faster to get through an area, more people decide to try driving there, and then it's crowded again, and the engineers say we need to speed things up. Keeping cars moving was a higher priority factor in designing this intersection than serving people outside cars. The clearest example is where First Street crosses New York Avenue in the southwest corner. There is no crosswalk on the east side of First Street. That's not due to lack of demand; the east side of First in NoMa is full of buildings and activity. Plenty of the Eckington neighborhood is on the east side as well. Further, in Concept 6, there's a protected bikeway on the east side of First. Then people on bikes heading north have to dismount, traverse three crosswalks, then ride in a bikeway on the west side of First through the former Wendy's, and then likely re-cross again to get back to the east side of Eckington Place. Why is this? It's a similar reason to the other places DDOT keeps designing missing crossings like at Massachusetts and H NW or 15th and W NW: they don't want to slow the cars much. They are using computers with traffic models which spit out the amount of car delay and sound warning bells if cars aren't moving fast, but don't have a similar constraint built in for whether they're sending cyclists through six crosswalks instead of two for little good reason. It's understandable though unfortunate that the engineers are so wedded to the constraints of their traffic models, which are at best approximations of reality. When they wanted to leave a missing crosswalk at Riggs Road and South Dakota Avenue NE near Fort Totten in 2009, then-DDOT Director Gabe Klein told them to change it. 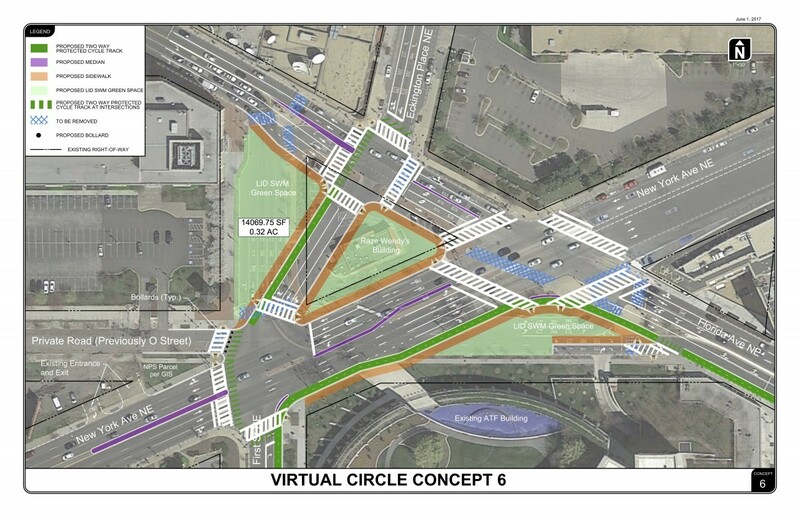 Here, DDOT needs to make this work with a crosswalk and continuous bikeway connection on the east side of First, so people can walk or bike directly from NoMa to Eckington without three extra crosswalks. 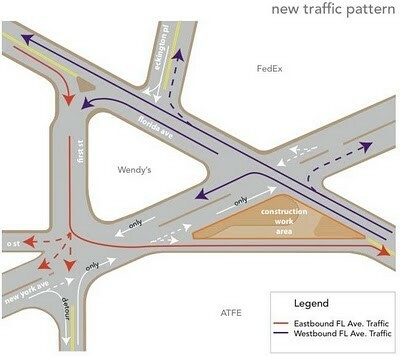 This likely requires not allowing a left turn from New York Avenue westbound to First Street southbound, and drivers will have to take a different path like going over to North Capitol Street. DDOT should also re-examine whether New York Avenue really needs to be eight lanes plus a bike lane and sidewalks. there are many divergent definitions of "fix" at play here. Those who think a pedestrian/cycling paradise is just over the horizon are envisioning something very different than the many who want some way to make it so their single-occupant car goes cross-town faster. It's probably worthwhile to spend $6 million to buy this land plus some more millions to build the intersection, but DC shouldn't emulate the worst elements of bad suburban road design when it does. Just say no to too many turn lanes and missing crosswalks.